These colourful children's resources feature flat felt characters and props for interactive Bible storytelling. The artwork coordinates with Kelly Pulley's popular illustrations in The Beginner's Bible. The components are all fade-resistant and washable. Height of human character: 16cm. Background boards sold separately. 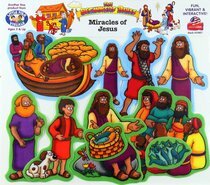 About "Miracles of Jesus (Beginners Bible In Felt Series)"
This colourful children's resource features flat felt characters and props for interactive Bible storytelling. The artwork coordinates with Kelly Pulley's popular illustrations in The Beginner's Bible. The components are all fade-resistant and washable. Height of human character: 16cm. Background boards sold separately.